Warner Pacific University is the only Church of God (Anderson, IN) institution of higher learning in the western United States. 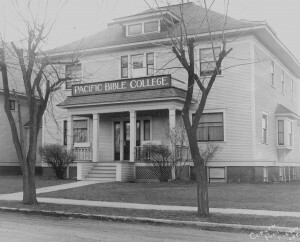 First known as Pacific Bible College, the school opened in 1937 in a two-story mission home in Spokane, Washington, with the expressed goal of training ministers and church workers. The 21-member student body was led by two faculty members, including founding president A.F. Gray. 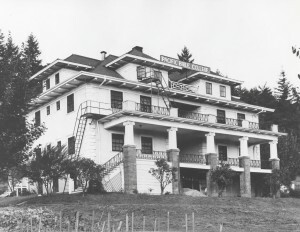 In 1940, church leaders moved the college to its present location in Portland, Oregon, where it initially took up residence in a large four-story house, nicknamed “Old Main.” Influenced by Wesleyan theology, the College upheld an historical critical reading of the Holy Scripture, use of human reason, reflection on experience and respect for tradition. Early graduates went on to notable terms of service as church leaders and missionaries in the United States and abroad. In 1959, the school changed its name to Warner Pacific College to reflect a growing emphasis on the liberal arts. Two years later, Warner Pacific became fully accredited by the Northwest Commission on Colleges and Universities, and WPC is also an active member of the Oregon Independent College Association. Throughout its history, Warner Pacific has demonstrated scholastic innovation that fosters critical thinking along with spiritual maturity. In 1974, the college introduced an innovative general studies program that sought to integrate a Christian worldview across key academic disciplines. Today, our core Humanities curriculum takes a “big questions” approach toward faith, ethics and civil responsibility, and culminates in a capstone thesis in which students examine a paradox within the human condition. Our liberal arts education—conducted within an atmosphere that acknowledges God as the source of all wisdom, and that human nature demands a striving for knowledge—celebrates the truths, profound mysteries and questions created by that interface. This is Warner Pacific College’s heritage, its current reality and its commitment to the future.